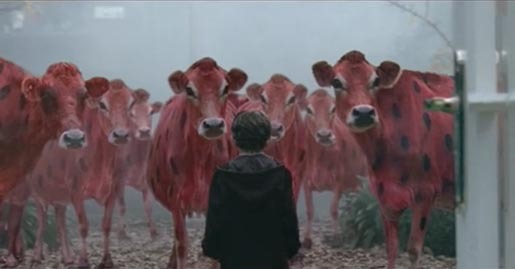 Three times in three years British food company Arla has promoted its Cravendale milk products with thriller TV commercials featuring cows. The ads, “Pursuit”, “Supermarket Heist” and “Hinted”, are featured in shockwave format at the Cravendale microsite, Protecting the Taste. The Cravendale Cows campaign was developed at DDB UK, London by copywriter Tim Charlesworth, art director Michael Kaplan, and agency producer Lucy Westmore. Pursuit was directed by Jason Smith via The Artists Company with producer Kate Collier. See Nigel Talamo’s Speed of Art site for photographs behind the scenes. Supermarket Heist was directed by Jason Smith via Brave Films with producer Emily Bliss. Director of photography was Simon Archer. Post production was done at VTR/Framestore CFC. Andy Sparrow has posted his pencil drawings of the storyboard. Sound production was done at Jungle Studios, London. The strawberry cows ad was created by DDB London team including creative director Jeremy Craigen, art director Michael Kaplan, copywriter Tim Charlesworth and agency producer Michael Parker. Director was Garth Davis via Anonymous Content with director of photography Greig Fraser and producer Karen Sproul. Editing was done by Stephen Gandolfi at Cut & Run, London. Post production was done at Framestore , London, with telecine provided by Matt Turner. Sound production was done at Wave Recording Studios, London. Voiceover was by Anthony Stewart Head, Giles from Buffy the Vampire Slayer.